For other uses, see Hanging Garden (disambiguation). This hand-coloured engraving, probably made in the 19th century after the first excavations in the Assyrian capitals, depicts the fabled Hanging Gardens, with the Tower of Babel in the background. The Seven Wonders of the World or the Seven Wonders of the Ancient World is a list of remarkable constructions of classical antiquity given by various authors in guidebooks or poems popular among ancient Hellenic tourists. Although the list, in its current form, did not stabilise until the Renaissance, the first such lists of seven wonders date from the 1st-2nd century BC. The original list inspired innumerable versions through the ages, often listing seven entries. Of the original Seven Wonders, only one—the Great Pyramid of Giza, the oldest of the ancient wonders—remains relatively intact. The Colossus of Rhodes, the Lighthouse of Alexandria, the Mausoleum at Halicarnassus, the Temple of Artemis and the Statue of Zeus were all destroyed. The location and ultimate fate of the Hanging Gardens are unknown, and there is speculation that they may not have existed at all. Babylon was a key kingdom in ancient Mesopotamia from the 18th to 6th centuries BC. The city was built on the Euphrates river and divided in equal parts along its left and right banks, with steep embankments to contain the river's seasonal floods. Babylon was originally a small Akkadian town dating from the period of the Akkadian Empire c. 2300 BC. The Neo-Babylonian Empire was a period of Mesopotamian history which began in 626 BC and ended in 539 BC. During the preceding three centuries, Babylonia had been ruled by their fellow Akkadian speakers and northern neighbours, Assyria. A year after the death of the last strong Assyrian ruler, Ashurbanipal, in 627 BC, the Assyrian empire spiralled into a series of brutal civil wars. Babylonia rebelled under Nabopolassar. In alliance with the Medes, Persians, Scythians and Cimmerians, they sacked the city of Nineveh in 612 BC, and the seat of empire was transferred to Babylonia for the first time since the death of Hammurabi in the mid-18th century BC. This period witnessed a general improvement in economic life and agricultural production, and a great flourishing of architectural projects, the arts and science. Nebuchadnezzar II, king of Babylon c. 605 BC – c. 562 BC, was the longest-reigning and most powerful monarch of the Neo-Babylonian Empire. The Medes were an ancient Iranian people who spoke the Median language and who inhabited an area known as Media between western and northern Iran. Under the Neo-Assyrian Empire, late 9th to early 7th centuries BC, the region of Media was bounded by the Zagros Mountains to its west, to its south by the Garrin Mountain in Lorestan Province, to its northwest by the Qaflankuh Mountains in Zanjan Province, and to its east by the Dasht-e Kavir desert. Its neighbors were the kingdoms of Gizilbunda and Mannea in the northwest, and Ellipi and Elam in the south. Strabo was a Greek geographer, philosopher, and historian who lived in Asia Minor during the transitional period of the Roman Republic into the Roman Empire. Diodorus Siculus or Diodorus of Sicily was a Greek historian. He is known for writing the monumental universal history Bibliotheca historica, much of which survives, between 60 and 30 BC. It is arranged in three parts. The first covers mythic history up to the destruction of Troy, arranged geographically, describing regions around the world from Egypt, India and Arabia to Greece and Europe. The second covers the Trojan War to the death of Alexander the Great. The third covers the period to about 60 BC. Bibliotheca, meaning 'library', acknowledges that he was drawing on the work of many other authors. Quintus Curtius Rufus was a Roman historian, probably of the 1st century, author of his only known and only surviving work, Historiae Alexandri Magni, "Histories of Alexander the Great", or more fully Historiarum Alexandri Magni Macedonis Libri Qui Supersunt, "All the Books That Survive of the Histories of Alexander the Great of Macedon." Much of it is missing. Apart from his name on the manuscripts, nothing else certain is known of him. This fact alone has led philologists to believe that he had another historical identity, to which, due to the accidents of time, the link has been broken. A few theories exist. They are treated with varying degrees of credibility by various authors. Meanwhile, the identity of Quintus Curtius Rufus, historian, is maintained separately. There are five principal writers whose descriptions of Babylon exist in some form today. These writers concern themselves with the size of the Hanging Gardens, their overall design and means of irrigation, and why they were built. Irrigation is the application of controlled amounts of water to plants at needed intervals. Irrigation helps to grow agricultural crops, maintain landscapes, and revegetate disturbed soils in dry areas and during periods of less than average rainfall. Irrigation also has other uses in crop production, including frost protection, suppressing weed growth in grain fields and preventing soil consolidation. In contrast, agriculture that relies only on direct rainfall is referred to as rain-fed or dry land farming. Titus Flavius Josephus, born Yosef ben Matityahu, was a first-century Romano-Jewish historian who was born in Jerusalem—then part of Roman Judea—to a father of priestly descent and a mother who claimed royal ancestry. Berossus was a Hellenistic-era Babylonian writer, a priest of Bel Marduk and astronomer who wrote in the Koine Greek language, and who was active at the beginning of the 3rd century BC. Versions of two excerpts of his writings survive, at several removes from the original. Marduk was a late-generation god from ancient Mesopotamia and patron deity of the city of Babylon. When Babylon became the political center of the Euphrates valley in the time of Hammurabi, he slowly started to rise to the position of the head of the Babylonian pantheon, a position he fully acquired by the second half of the second millennium BC. In the city of Babylon, Marduk was worshiped in the temple Esagila. Marduk is associated with the divine weapon Imhullu. "Marduk" is the Babylonian form of his name. Quintus Curtius Rufus (fl. 1st century AD) probably drew on the same sources as Diodorus. He states that the gardens were located on top of a citadel, which was 20 stadia in circumference. He attributes the building of the gardens to a Syrian king, again for the reason that his queen missed her homeland. The account of Strabo (c.64 BC – 21 AD) possibly based his description on the lost account of Onesicritus from the 4th century BC. He states that the gardens were watered by means of an Archimedes' screw leading to the gardens from the Euphrates river. The last of the classical sources, thought to be independent of the others, is A Handbook to the Seven Wonders of the World by Philo of Byzantium (writing in the 4th to 5th century AD; not to be confused with Philo of Byzantium, who lived ca. 280 BC – ca. 220 BC). The method of raising water by screw matches that described by Strabo. Philo praises the engineering and ingenuity of building vast areas of deep soil, which had a tremendous mass, so far above the natural grade of the surrounding land, as well as the irrigation techniques. This copy of a bas relief from the North Palace of Ashurbanipal (669–631 BC) at Nineveh shows a luxurious garden watered by an aqueduct. The name "Babylon", meaning "Gate of the Gods"  was applied to several Mesopotamian cities. Sennacherib renamed the city gates of Nineveh after gods,  which suggests that he wished his city to be considered "a Babylon". The descriptions of the classical authors fit closely to these contemporary records. Before the Battle of Gaugamela in 331 BC Alexander the Great camped for four days near the aqueduct at Jerwan. The historians who travelled with him would have had ample time to investigate the enormous works around them, recording them in Greek. These first-hand accounts do not survive into our times but were quoted by later Greek writers. King Sennacherib's garden was well-known not just for its beauty – a year-round oasis of lush green in a dusty summer landscape – but also for the marvelous feats of water engineering that maintained the garden. There was a tradition of Assyrian royal garden building. King Ashurnasirpal II (883–859 BC) had created a canal, which cut through the mountains. Fruit tree orchards were planted. Also mentioned were pines, cypresses and junipers; almond trees, date trees, ebony, rosewood, olive, oak, tamarisk, walnut, terebinth, ash, fir, pomegranate, pear, quince, fig, and grapes. A sculptured wall panel of Assurbanipal shows the garden in its maturity. One original panel  and the drawing of another  are held by the British Museum, although neither is on public display. Several features mentioned by the classical authors are discernible on these contemporary images. Of Sennacherib's palace, he mentions the massive limestone blocks that reinforce the flood defences. Parts of the palace were excavated by Austin Henry Layard in the mid-19th century. His citadel plan shows contours which would be consistent with Sennacherib's garden, but its position has not been confirmed. The area has been used as a military base in recent times, making it difficult to investigate further. Sennacherib king of the world king of Assyria. Over a great distance I had a watercourse directed to the environs of Nineveh, joining together the waters.... Over steep-sided valleys I spanned an aqueduct of white limestone blocks, I made those waters flow over it. Sennacherib claimed that he had built a "Wonder for all Peoples," and said he was the first to deploy a new casting technique in place of the "lost-wax" process for his monumental (30 tonne) bronze castings. He was able to bring the water into his garden at a high level because it was sourced from further up in the mountains, and he then raised the water even higher by deploying his new water screws. This meant he could build a garden that towered above the landscape with large trees on the top of the terraces – a stunning artistic effect that surpassed those of his predecessors. Nineveh was an ancient Assyrian city of Upper Mesopotamia, located on the outskirts of Mosul in modern-day northern Iraq. It is located on the eastern bank of the Tigris River, and was the capital of the Neo-Assyrian Empire. Today it is a common name for the half of Mosul which lies on the eastern bank of the Tigris. Sennacherib was the king of Assyria from 705 BCE to 681 BCE. He is principally remembered for his military campaigns against Babylon and Judah, and for his building programs – most notably at the Akkadian capital of Nineveh. He was assassinated in obscure circumstances in 681 BCE, apparently by his eldest son. The 7th century BC began the first day of 700 BC and ended the last day of 601 BC. An Archimedes' screw, also known by the name the Archimedean screw or screw pump, is a machine used for transferring water from a low-lying body of water into irrigation ditches. Water is pumped by turning a screw-shaped surface inside a pipe. The year 681 BC was a year of the pre-Julian Roman calendar. In the Roman Empire, it was known as year 73 Ab urbe condita. The denomination 681 BC for this year has been used since the early medieval period, when the Anno Domini calendar era became the prevalent method in Europe for naming years. Nabopolassar (; cuneiform: ‭”⌉⍑⌶dAG.IBILA.URU3Akkadian: Nabû-apla-uṣur; c. 658 BC – 605 BC) was a Chaldean king of Babylonia and a central figure in the fall of the Neo-Assyrian Empire. The death of Assyrian king Ashurbanipal around 627 BC resulted in political instability. In 626 BC, a native dynasty arose under Nabopolassar. He made Babylon his capital and ruled over Babylonia for a period of about twenty years (626–605 BC). He is credited with founding the Neo-Babylonian Empire. By 616 BC, Nabopolassar had united the entire area under his rule. Ashurbanipal, also spelled Assurbanipal or Ashshurbanipal, was King of the Neo-Assyrian Empire from 668 BC to c. 627 BC, the son of Esarhaddon and the last strong ruler of the empire, which is usually dated between 934 and 609 BC. He is famed for amassing a significant collection of cuneiform documents for his royal palace at Nineveh. This collection, known as the Library of Ashurbanipal, is now in the British Museum, which also holds the famous Lion Hunt of Ashurbanipal set of Assyrian palace reliefs. Philo of Byzantium, also known as Philo Mechanicus, was a Greek engineer, physicist and writer on mechanics, who lived during the latter half of the 3rd century BC. Although he was from Byzantium he lived most of his life in Alexandria, Egypt. He was probably younger than Ctesibius, though some place him a century earlier. Amuhia or Amytis of Media was the daughter or granddaughter of the Median king Cyaxares, and the wife of Nebuchadnezzar II. A screw pump is a positive-displacement (PD) pump that use one or several screws to move fluids or solids along the screw(s) axis. In its simplest form, a single screw rotates in a cylindrical cavity, thereby moving the material along the screw's spindle. This ancient construction is still used in many low-tech applications, such as irrigation systems and in agricultural machinery for transporting grain and other solids. Jerwan is a locality north of Mosul in the Nineveh Province of Iraq. The site is clear of vegetation and is sparsely settled. Stephanie Mary Dalley FSA is a British scholar of the Ancient Near East. She has retired as a teaching Fellow from the Oriental Institute, Oxford. She is known for her publications of cuneiform texts and her investigation into the Hanging Gardens of Babylon, and her proposal that it was situated in Nineveh, and constructed during Sennacherib's rule. The Sargonid dynasty is an academic name for the final ruling family of the Neo-Assyrian Empire, beginning with Sargon II's ascent to the throne in 722 BC until the death of Sîn-šarru-iškun and the fall of the kingdom in 612 BC at the hands of a coalition of invaders. The dynasty was the last of the great Assyrian kings and came at the end of a 1500-year period of Assyrian ascendancy. 1 2 3 Stephanie Dalley (1993). "Ancient Mesopotamian Gardens and the Identification of the Hanging Gardens of Babylon Resolved". Garden History. 21: 7. JSTOR 1587050. 1 2 3 Reade, Julian (2000). 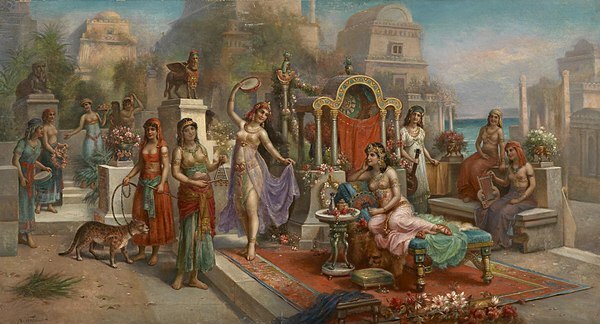 "Alexander the Great and the Hanging Gardens of Babylon". Iraq. 62: 195. doi:10.2307/4200490. ISSN 0021-0889. ↑ Foster, Karen Polinger (2004). "The Hanging Gardens of Nineveh". Iraq. 66: 207. doi:10.2307/4200575. ISSN 0021-0889. 1 2 "The Hanging Gardens of Babylon" . Retrieved 5 February 2014. 1 2 Cartwright M (July 2018). "Hanging Gardens of Babylon". Ancient History Encyclopedia. Retrieved 15 September 2018. 1 2 3 Finkel (1988) p. 41. ↑ Finkel (1988) p. 58. ↑ Finkel, Irving; Seymour, Michael (2008). Babylon: City of Wonders. London: British Museum Press. p. 52. ISBN 0-7141-1171-6. ↑ "The Hanging Gardens of Babylon" . Retrieved 5 February 2014. ↑ Dalley, Stephanie (2013). The Mystery of the Hanging Garden of Babylon: an elusive World Wonder traced. Oxford University Press. ISBN 978-0-19-966226-5. ↑ Finkel (2008) p. 108. ↑ Dalley, Stephanie (1994). "Nineveh, Babylon and the Hanging Gardens: Cuneiform and Classical Sources Reconciled". Iraq. 56: 45. doi:10.2307/4200384. ISSN 0021-0889. ↑ Joseph. contr. Appion. lib. 1. c. 19.—Syncel. Chron. 220.—Euseb. Præp. Evan. lib. 9. ↑ Strabo, Geography XVI.1.5, translation adapted from H.L. Jones, Loeb Classical Library edn (1961). ↑ That is, Philo the Paradoxographer of Byzantium, not Philo the Engineer of Byzantium. See Stephanie Dalley, "More about the Hanging Gardens," in Of Pots and Pans: Papers on the Archaeology and History of Mesopotamia and Syria as presented to David Oates on his 75th Birthday, Edited by L. al-Gailani-Werr, J.E. Curtis, H. Martin, A. McMahon, J. Oates and J.E. Reade, (London), pp. 67–73 ISBN 1-897750-62-5. ↑ Dalley (2013), p. 40. Dalley bases her translation on Brodersen (1992) who uses an early Greek text. A previous translation by David Oates, based on a Latin text, is found in Finkel (1988) pp. 45–46. ↑ Finkel (2008) p. 109. ↑ Priestley, Jessica (2014). Herodotus and Hellenistic culture: Literary Studies in the Reception of the Histories. Oxford: Oxford University Press. p. 91. ↑ Joan Oates, Babylon, Revised Edition, Thames and Hudson, London (1986) p. 144 ISBN 0500273847. ↑ Alberge, Dalya (5 May 2013). 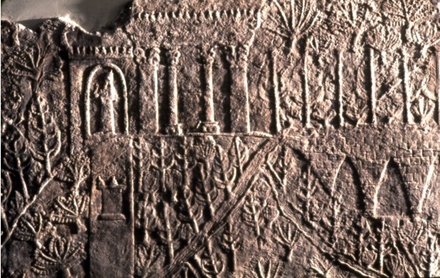 "Babylon's hanging garden: ancient scripts give clue to missing wonder". The Guardian. Retrieved 6 May 2013. ↑ Dalley, Stephanie (2013) The Mystery of the Hanging Garden of Babylon: an elusive World Wonder traced, Oxford University Press ISBN 978-0-19-966226-5. ↑ See Dalley (2013) ch 1 for a summary. ↑ Stephanie Dalley (2013). The Mystery of the Hanging Garden of Babylon: An Elusive World Wonder Traced. Oxford University Press. pp. 65–82. ISBN 978-0-19-966226-5. The quotations in this section are the translations of the author and are reproduced with the permission of OUP. Finkel, Irving (1988). "The Hanging Gardens of Babylon". In Clayton, Peter; Price, Martin. The Seven Wonders of the Ancient World. New York: Routledge. pp. 38 ff. ISBN 0-415-05036-7. Finkel, Irving L.; Seymour, Michael J., eds. (2008). Babylon. New York: Oxford University Press. ISBN 0-19-538540-3. Dalley, Stephanie (2013). 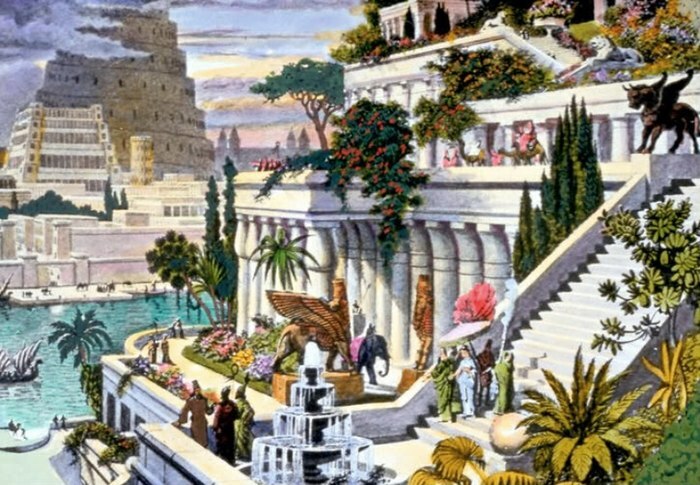 The Mystery of the Hanging Garden of Babylon: an elusive World Wonder traced. Oxford University Press. ISBN 978-0-19-966226-5. Dalley, Stephanie. 1994. "Nineveh, Babylon and the Hanging Gardens: Cuneiform and Classical Sources Reconciled." Iraq 56: 45-58. doi:10.2307/4200384. --. 2013. The Mystery of the Hanging Garden of Babylon: An Elusive World Wonder Traced. Oxford: Oxford University Press. Norwich, John Julius. 2009. 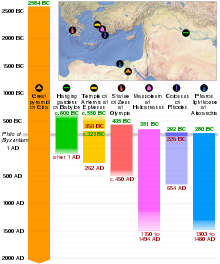 The Great Cities In History. London: Thames & Hudson. Reade, Julian. 2000. "Alexander the Great and the Hanging Gardens of Babylon." Iraq 62: 195-217. doi:10.2307/4200490. Wikimedia Commons has media related to Hanging Gardens of Babylon .